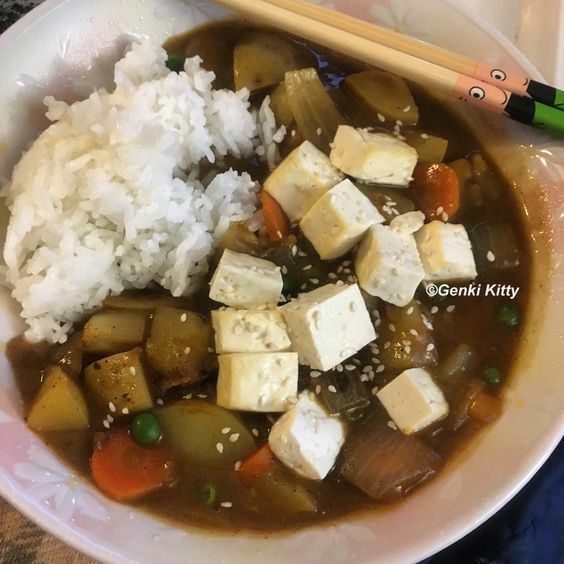 Curry from any country is a favorite of mine, especially Japanese curry since I used to live there. Unfortunately most Japanese foods do contain MSG, so it is important to look at the ingredients before purchasing anything from a store/restaurant. 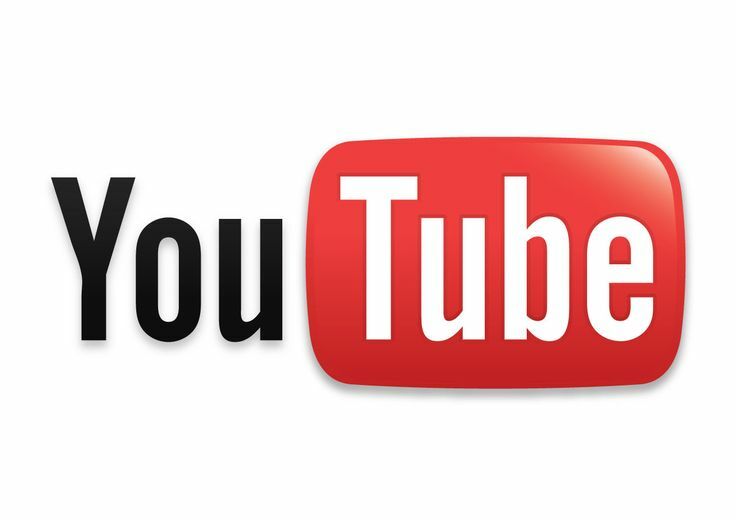 MSG has been a discussion for many years while it is healthy or unhealthy for an unborn child. My thoughts on the matter is any additive, especially those that are still being researched, shall just be avoided. There are so many foods to eat during pregnancy, just go with something else. In my case, I made my own curry with Japanese curry powder containing no MSG. There are also a few brands that do not contain MSG but again, I didn’t want any additives so I stayed away from them. The recipe I used was from Vegetarian Times but I did not use Worcestershire Sauce and only used no sodium broth. On the weekends, Genki Husband was so kind to BBQ vegan burgers on homemade vegan buns. 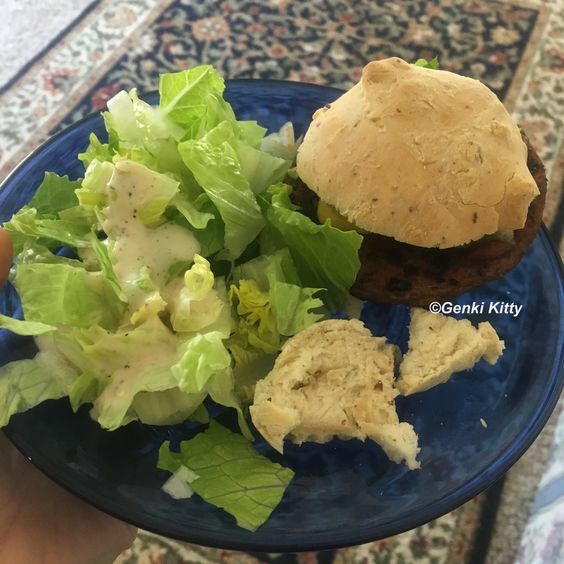 Occasionally we would have homemade black bean burgers but we did also have Gardein Ultimate Beefless Burgers which pack 15g protein and only 5g fat. Yes, these are repacked with preservatives however with all the protein, these are hard to pass up. We used white whole wheat flour to make the buns which also contained flaxseeds which pack in some omega-3 fatty acids. An added plus is these little seeds help balance hormones which is always a plus when pregnant, especially with multiple pregnancies. Buddha Bowls were a major player throughout my entire pregnancy. 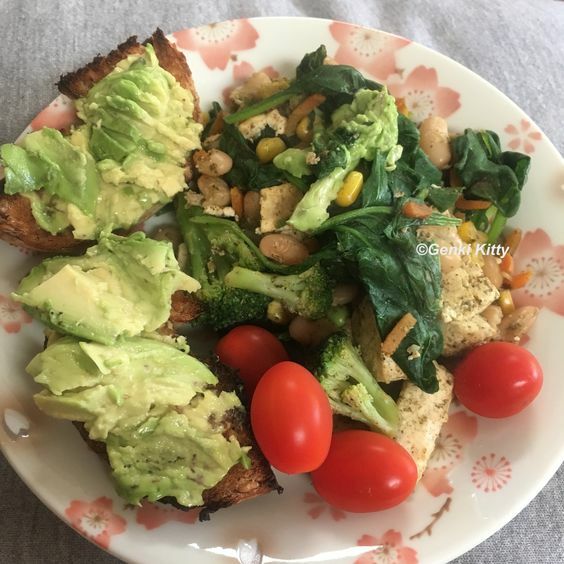 During my second trimester I was all for as many vegetables as possible, nutrients build babies during this trimester (protein is essential to double but triple in your third). This bowl had quinoa, capers, colored bell peppers, a mixture of mushrooms/spinach/onion, cucumber, lettuce and a sweet potato. On the side I had mixed fruit and some steamed edamame. Usually I would make a large meal and then nibble on the leftovers such as fruit during a snack (or all in one go). Once you hit the last part of your second trimester, your stomach will be full of growing babies and not much room for anything else. So eating every hour or two hours is the main attempt for mothers of multiples. 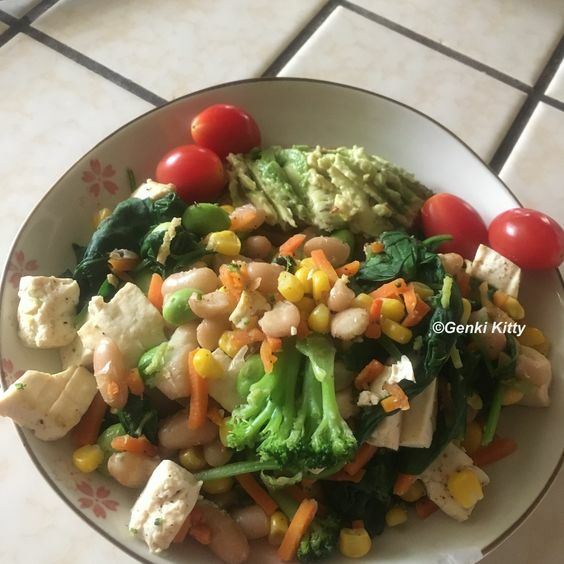 I tried to get a little of the rainbow in just about every meal. As a true wife that stays home (since my doctor doesn’t recommend twin pregnant expectant mothers to work), I would a lot of the time just toss things together from the fridge. 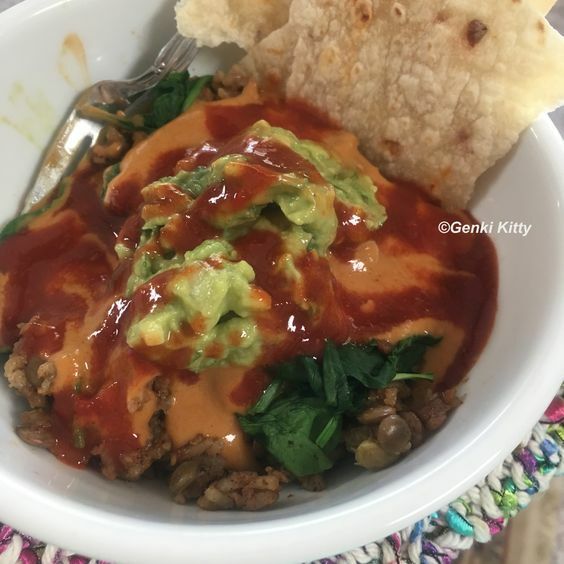 This plate was filled with oil free corn tortilla chips (homemade), sweet potato (which I ate 1/2 before being warmed), a salad topped with tons of black beans, refried beans, avocado mashed, bell peppers, homemade salsa and a some homemade oil free chez sauce. These pancakes may look a lot like traditional pancakes but they are actually protein packed powerhouses. I created this 5 ingredient recipe so I could add some more protein into my diet while still having a little fun with my food. 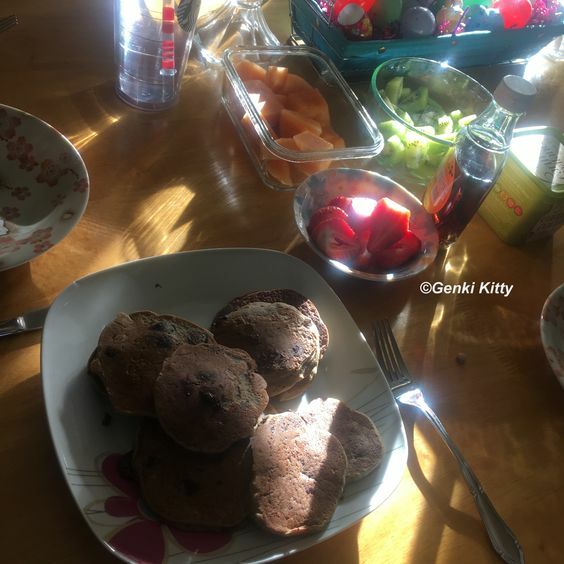 This was actually our vegan breakfast for Easter, since our traditional Easter celebration breakfast contains too much sugar. These were a great option alongside a ton of freshly cut fruit. For those of you wondering, fruit does contain sugar however it is processed differently in the body and therefore doesn’t spike sugar the same way. Throughout my entire pregnancy, I planned the meals we would eat after returning home from the hospital. My mother actually came out for the first week after the twins were born and she was surprised she had nothing to do while here but cuddle with the twins. She didn’t complain one bit, and neither did Genki Husband as he had delicious food and didn’t have to think of what to make. I actually prepared this ahead and froze it for our return. 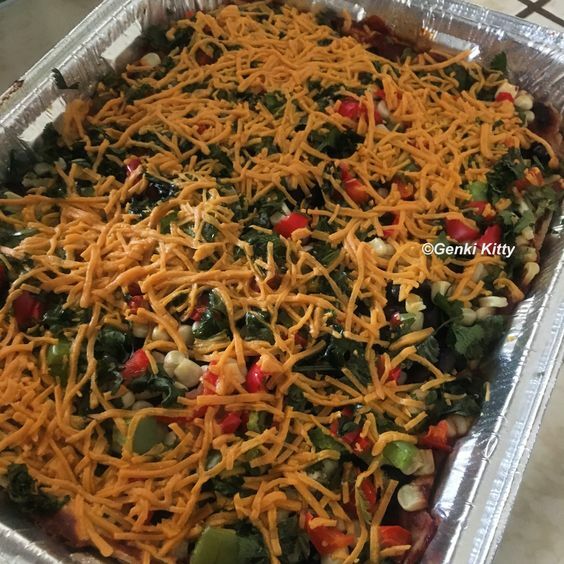 This is vegan enchilada lasagna, original recipe. It’s super easy to put together and warms up great! We did end up using a few different sodium free sauces during the pregnancy but afterwards we use the regular ones mentioned in the original recipe, both are great! I would take a portion and place on top of a bed of spinach and/or lettuce to make it more green per my tastebuds and nutritional needs. 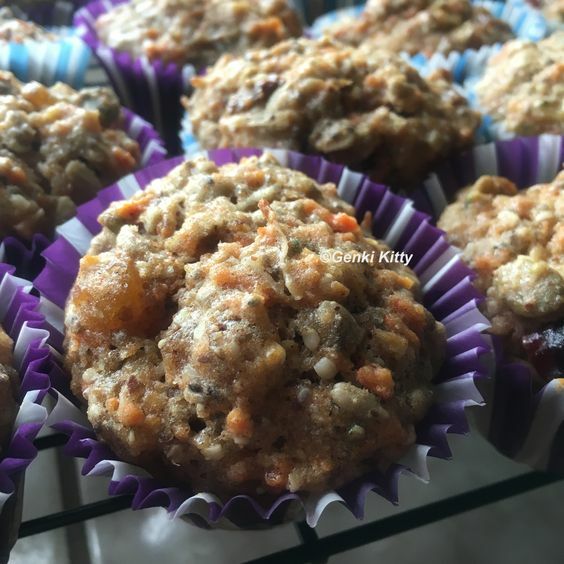 Another recipe I have made a few times, before and after the pregnancy. I made a few batches for the freezer and we enjoyed them after we returned home, along with my non-vegan mother and her friend. These are Fuel to Go Muffins, the original recipe. I used all natural, organic ingredients while pregnant and I used fresh fruit instead of canned, perfect. After the pregnancy, I have made the recipe with the original recipe ingredients (vegan) and it was just as tasty. Muffins are so easy to eat at the hospital (when they don’t bring you food) and at home when you don’t want to cook or eat oats. 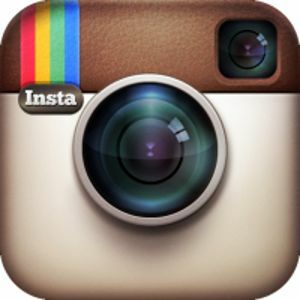 If you are following along with the foods I ate while pregnant, you will notice I did skip oily foods. This is not because I do not think fat is essential for unborn babies, rather it did not settle in my stomach. So, I stayed away from a lot of oily foods and ate healthy fats such as avocado or peanut butter. 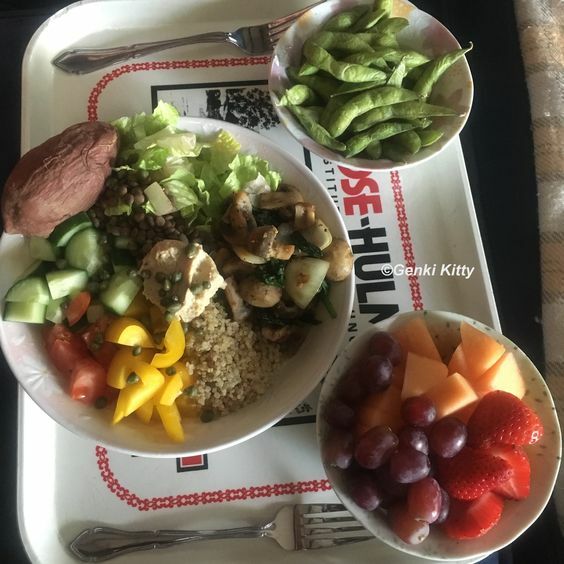 This meal was another one of those after an appointment and my OB stated, “you can feel free to eat as much as you want, gain a little more weight if you want”. After these appointments, I would eat a meal that was not as healthy but high in calories. Yep, it didn’t last in my stomach. 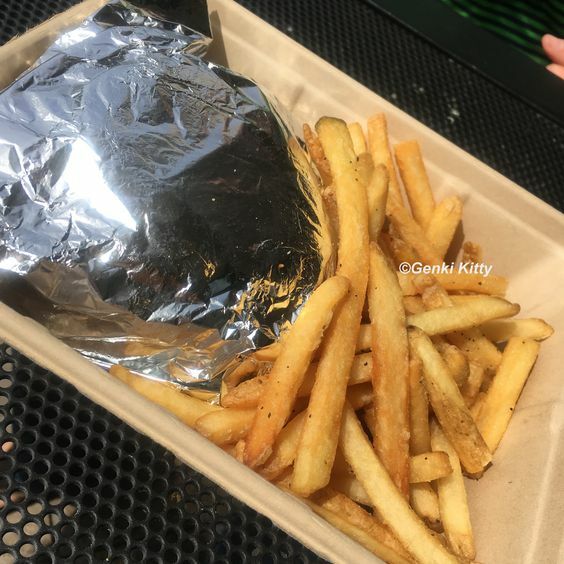 This was at Whole Foods Market, the fries Genki Husband would eat and I would have 1/2 the Vegan Burger which was a whole grain organic sprouted burger made from grains such as quinoa and etc. Then I would eat a lot of veggies on the side from my personal car cooler and maybe even an all fruit smoothie. Sometimes these meals are an option if you are in the mood, just try not to overdo it. Green smoothies were always a favorite of mine, after all, what a better method to get a ton of nutrients into my body and to the twins?! Usually I would make a smoothie with protein powder (usually for a snack or a first breakfast meal), unsweetened almond milk, tons of spinach, a clementine, ginger, and etc. 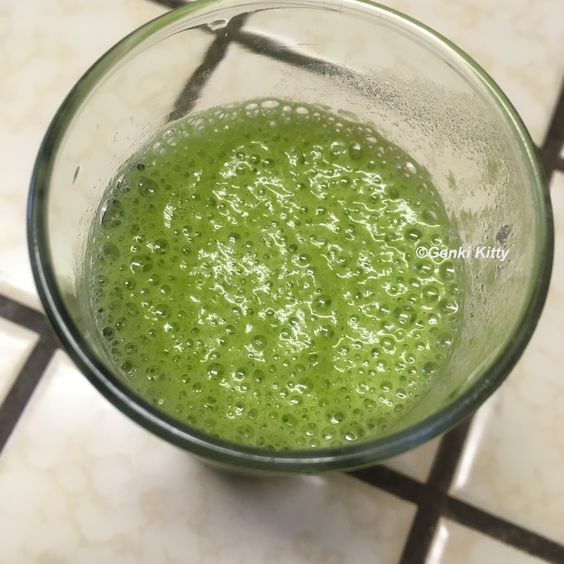 My only requirement was it had to have protein powder, spinach and a citrus with vitamin C. Some days I would have two of these smoothies for extra added protein and nutrients. 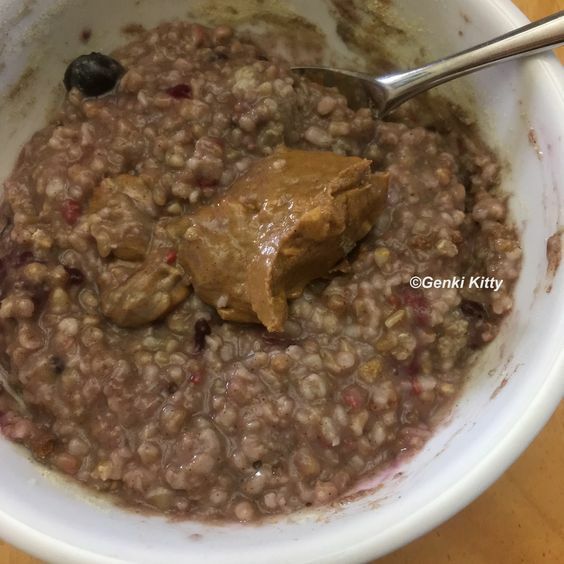 Oatmeal was a favorite of mine before the pregnancy however when I got pregnant I took off from them during the first trimester since I was eating mostly beans and vegetables. During the second trimester I went ahead and started up with oats a few times a week, keeping with beans/rice/vegetables breakfast most of the time. My oatmeal changed drastically though during the pregnancy,. First off, I started to add protein powders (I used raw vegan protein powder only). As toppers, I used peanut butter (switching to PB2 a lot of the time because too much fat in my diet make me feel terrible), chia seeds and/or flaxseeds, homemade chia seed jam and occasionally other whole plant based ingredients such as seasonal fruit. Occasionally I would make the oats with zucchini, carrots or other vegetables. During my third trimester, I switched to Bob’s Red Mill 6 grain hot cereal which is basically whole organic grains such as wheat, spelt, flax, etc (tastes like oatmeal only no processing). This can be purchased at Whole Foods, a few health food stores and Vitacost (I made large orders every month from Vitacost or iHerb online as it was easier to shop while on the sofa). Something different I used to eat was breakfast sandwiches, which does have processed ingredients. 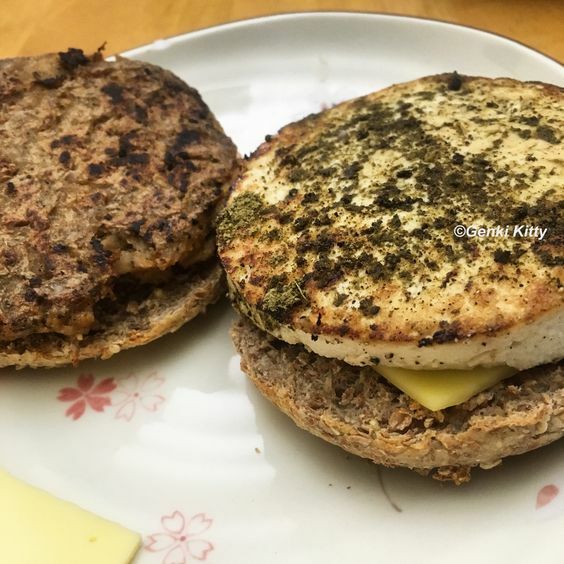 I used Ezekiel Whole sprouted grain english muffins(Note: There is also a reduced sodium version I believe still however I did not care for the taste), tofu with no-salt poultry seasoning, vegan cheese and vegan sausage. I would make a large amount of these for Genki Husband to take to work and freeze individually. Then when I felt like I wanted something a bit different, I would eat these as the protein content was extremely high. 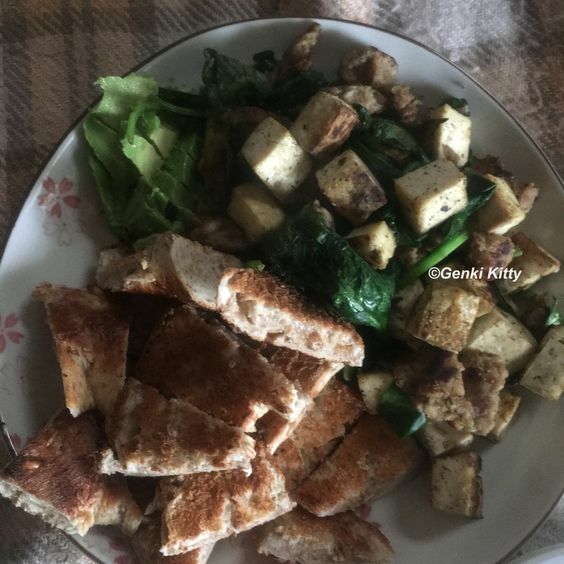 A meal I wold eat a lot for all meals of the day, vegetable and tofu sautéed. This included spinach, kale, sweet potatoes, mushrooms, tofu and a curry sauce made from Japanese curry powder (not the bouillon as it has MSG, something I chose not to eat during pregnancy). 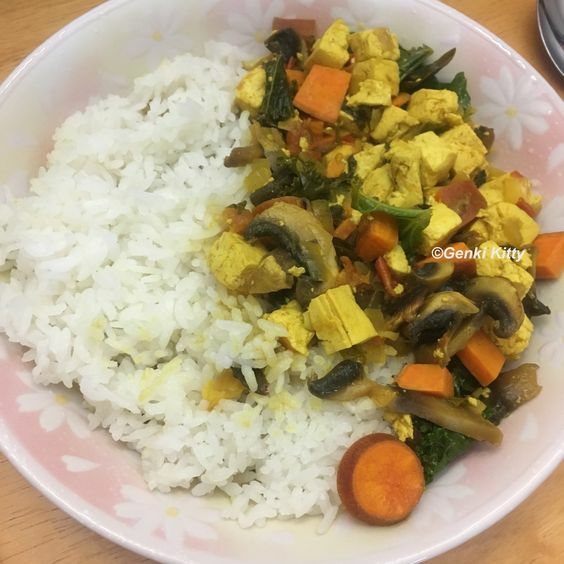 To make the sauce, take curry powder and sprinkle over the vegetables and tofu, add just enough water to cover the vegetables and simmer until all vegetables are tender. If you aren’t worried about sodium, go ahead and add vegetable broth and/or coconut milk. You can use just about any ingredients in this recipe, it’s simple but adds a lot of nutrients. On the side is steamed Japanese premium rice. My favorite breakfast recipe during this trimester, yes it changed often. Sprouted Whole Grain Organic bread topped with an avocado. The main event was a sauté of vegetables such as broccoli, corn, carrots, spinach and tomatoes. Added was home cooked beans and tofu. Usually I would sprinkle with nutritional yeast for added B12 and protein. Seasoning would be a no-sodium poultry seasoning or just pepper. 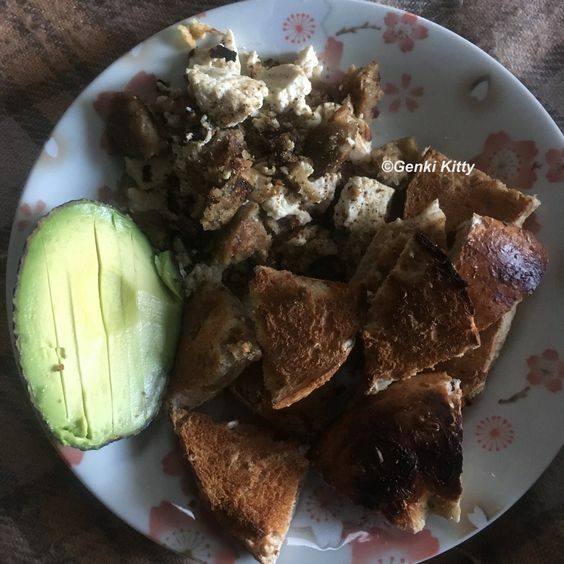 Another breakfast of vegan sausage and tofu scramble, a bagel in pieces and 1/2 an avocado. A lot of the time I would eat two bagels but it would depend on my level of hunger, near the end of my 2nd my stomach could not handle much. During this time, my meals would be spread out so this might be my second breakfast of the day. I would eat every 2-3 hours to assure I was providing the twins with the necessary calories/nutrients. 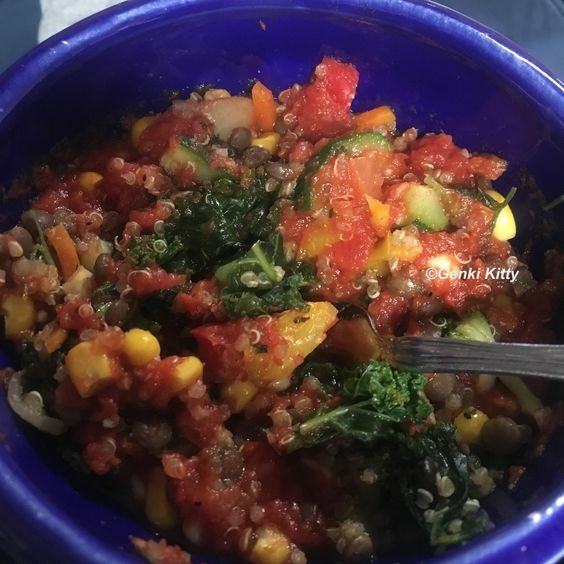 Vegetables stews were really popular in our household because I would toss in a lot of vegetables for various nutrients (eat the rainbow) and then added quinoa and lentils for protein power. If you haven’t noticed yet, kale and spinach were in everything I ate! Note: Always add vitamin C with iron-rice veggies so assure the iron is absorbed into the body. Another breakfast, I seriously ate this a lot near the end of my 2nd because it provided a lot of protein while not being over filling. There was avocado on the side and fat-free peanut butter powder made into a spread (just peanuts, no additives). Notice the 1/2 bag of spinach, yum! This is one of the easiest meals to make for any meal of the day. This is leftover rice sautéed with no oil. 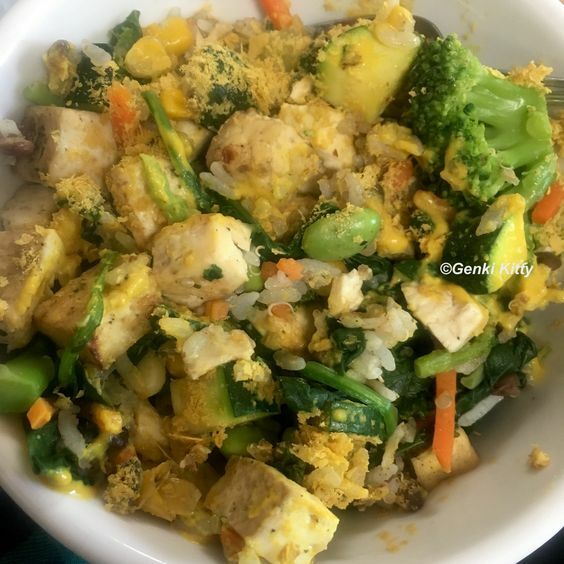 It contains Japanese premium steamed rice, a load of spinach, mixed organic frozen veggies, tofu, quinoa, zucchini and a lot of nutritional yeast. Mix it all together and have a lovely meal. This is another form of the meal above… This has added beans and broccoli. On the side I had a sprouted whole grain bagel (no additives, nor flour) with avocado and fresh basil from our garden. You can add anything in this meal. See, ate it all the time! This is the same meal only I had a ton more protein such as tofu, quinoa and beans. A salad that was delicious! 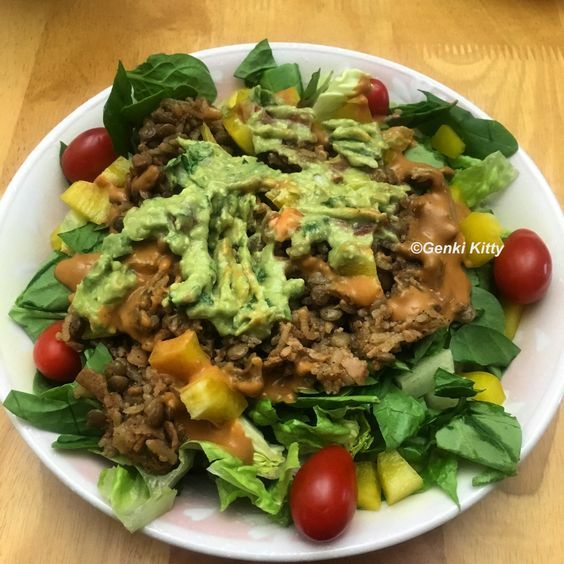 The bottom layer is a ton of spinach, lettuce, tomatoes, bell peppers, a rice/lentil mixture, avocado, leftover vegan nacho cheese sauce made from red bell peppers. The rice/lentil mixture is made in our rice maker using 1:1 ratio of lentils and rice with vegan low-sodium broth. Simple and easy. This is the same lentil/rice mixture made with a ton of spinach steamed on top. 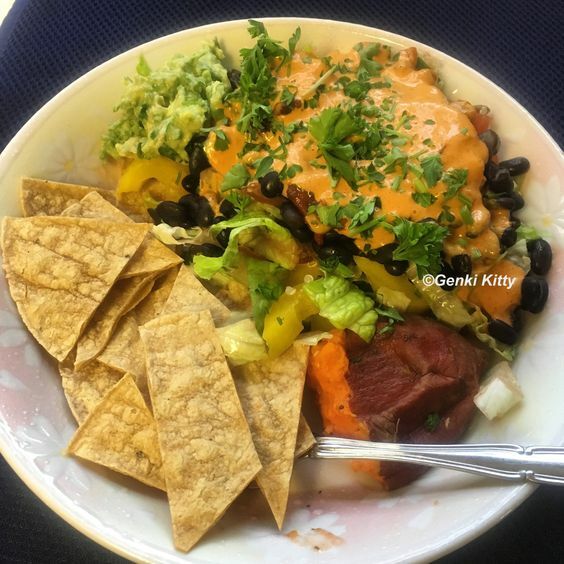 Added vegan nacho cheese sauce made from red bell peppers and a ton of Trader Joe’s no sodium hot sauce and fresh avocado. On the side is a piece of tortilla with no preservatives and vegan approved. 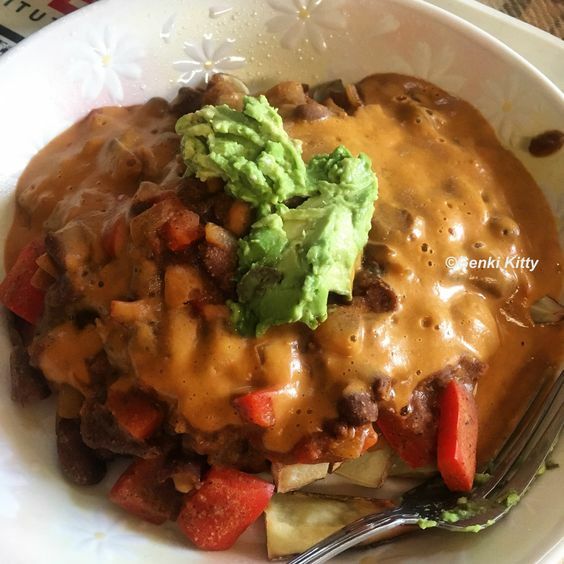 This is the cheese sauce that I used above… This is chili fries made from plant-based ingredients and very filling! Recipe I made this recipe a lot because it was super easy and not hard to make could be done without any oil. This post is getting long, once again. 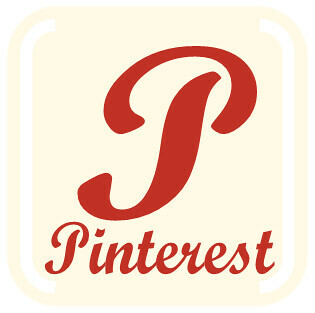 I’ll post possibly one more for my second trimester to help with ideas if you are pregnant with multiples or singleton. My pregnancy was super easy and we were totally blessed with two extremely healthy babies from day 1. In the hospital we were the only parents with twins passing with flying colors for health upon birth, a big feat as there were three other twins born while we were in there and a set of triples. All others were born early, we were blessed to have walked into our c-section at full term. It’s hard as hospitals take twins and really inspect them to try to get them in the NICU for anything as small as a hangnail… So we were blessed.